How many of you remember “Red” (George or B. F.?) Hewitt? I got to thinking about him while looking at the businesses on the old plat map of Concordia. He was the local veterinarian in Concordia during the early to mid-1900s. His place of business (a.k.a. People's Laboratory) and home was the old building on the south side of 7th Street between Main and Orange, just behind Dierker’s Store. Red’s claim to fame was his poultry medicine. It was a mysterious red powder that he concocted from a secret formula of his. One would mix it in the drinking water to cure whatever ails poultry. My mother used it on various occasions for the chickens we raised in our back yard. During the 1940s, Red raised a precocious young lad nicknamed “Dickie”. Dickie was known for his violent tantrums, flailing around on the floor when he didn’t get his way. Because of the considerable age difference between him and Red, I never was sure of their relationship. Was Richard an adopted son or possibly a grandson? Red was not particularly outgoing but, because his shop was directly across from our lumber yard, I did speak with him at various times. Anyway, on to the recollection that I wanted to relate. The bird hunters around Concordia were beginning to complain about the decline in wildlife in the area. Other than the migrating ducks and geese, there were only a few quail to be found. So Red came up with a grand plan. He would raise pheasants from chicks and sell them to farmers so that they could release the birds in the brush and woods on their farms. One spring, he bought a large quantity of pheasant eggs (from wherever one buys pheasant eggs) and hatched them, possibly at Chet Gibson’s hatchery. He then fenced in the large lot next to his veterinary shop (where the post office now stands) and turned them loose to grow. The old Catholic Church building on the corner had been torn down by them. From across the street, we enjoyed watching their progress as they grew through the summer. But then disaster struck. Some ailment infected the entire flock and they all died. Red’s project was a total loss. His magic red powder wasn’t able to save them. One of the things that surprised me was Red Hewitt’s apparent musical talent. Red was a crusty old curmudgeon and I wouldn’t have expected it. My sister found an old talent show program among my mother’s papers. See the posting below. While the date and location are not included, it seems to be a program sponsored by the Lions Club, possibly at Concordia High School. Note that Dr. Scholle gave the welcoming address. While there are a number of familiar names among the performers, notice that one of the groups was George Hewitt’s Band consisting of George Hewitt, Al Damman, Hobart and Raymond Schelp. Because the Schelp brothers were members, it may have been a country music band. This was probably before Hobart hit the road with his “Hobie Shepp” group. Notice also that Topsy Oetting had a band besides running his restaurant and pool hall. Walter Rosebrock gave one of his famous cartoon presentations. It was quite a varied program. Does anyone remember when this program and possibly others like it were held? How many of these people do you recall? 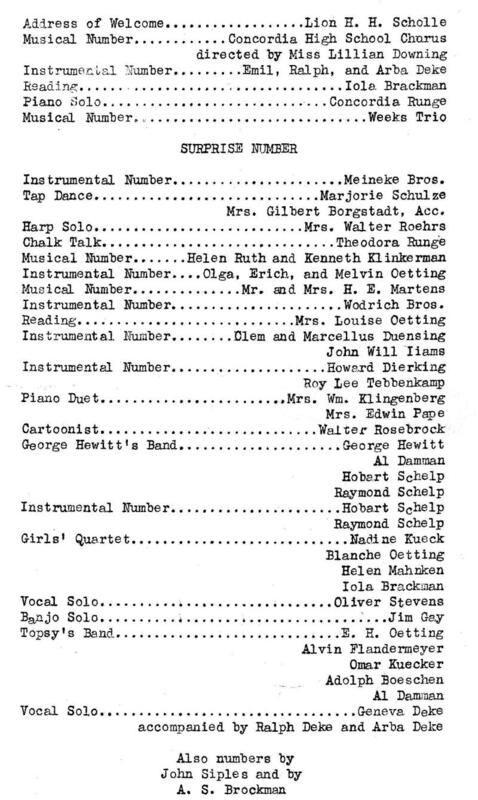 Program for talent show held in Concordia, MO possibly in the 1940s.